Over the past couple of months I have heard talk about a new movie coming out starring Emma Stone. And since I had recently seen Easy A and thought it was crazy good, I was ready for more Miss Stone. Then I heard what it was about and, honestly, I lost all interest in seeing it. Sitting through an almost two hour movie about black maids and their white bosses set in 1960’s Jackson, Mississippi, did not sound appealing to me. But, while I was at Borders, I saw two females standing in front of a set of books commenting on how it was one of the best books they had ever read. 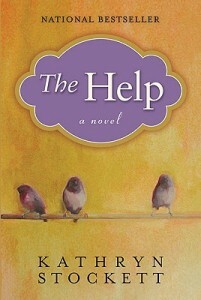 I walk over, and low and behold, The Help by Kathryn Stockett. And as I stood there looking at it, five more copies went off the shelf. My curiosity got the best of me, so I bought one. It took me two days to read. I could not put it down. I cried. I laughed. But, mainly, I got angry. Angry at the stupidity and closed-mindedness of people in those times. Really, you think that by just using a toilet after an African-American, you will get a disease? There were a few times I had to put the book down and walk away because I was furious…at one character in particular, Miss Hilly (you will learn to hate her). Stockett separated the chapters into the point of view of three characters: Aibileen, Minny, and Miss Skeeter. Aibileen is an older African American maid who works for Miss Elizabeth. She is sweet and gentle. One of her main jobs is to look after Elizabeth’s toddler, Mae Mobley (Mae Mo , for short), who is neglected by her mother. She tries her best to teach Mae Mo that she is a good girl, that she is special, and that she is loved. Minny is a younger African American maid who is out-spoken and can come off rude, which is not good for a maid during this time. She has been fired often because of her mouth, but is an amazing cook. She starts off working for Miss Walters (Hilly’s mother). Hilly lies about Minny, calls her a thief, and fires her. Then Hilly spreads rumors about Minny being a thief so she has a hard time getting hired. Fortunately, a new woman moves to town, Miss Celia, who doesn’t hear the rumors and hires Minny as her maid and cook. Last, is Miss Skeeter. Miss Skeeter’s real name is Eugenia Phelan and she is a young woman who grew up on a cotton farm. She recently graduated from Ole Miss and hoped to be a journalist/writer. She applies for many different writing positions, but is eventually hired on at her local paper to continue answering question about housekeeping. Since she knows nothing of housekeeping, she asks Miss Elizabeth if she can receive help from Aibileen. After realizing how differently the maids are treated, Miss Skeeter decides to write a book, called Help, from their point of view. She wants to show others the good and bad side of being an African American maid in a white household. She hopes by getting the stories out, that maybe the maids will be treated better. She first recruits Aibileen to tell her story. Aibileen is nervous because she is afraid someone will find out and she will be punished. Eventually, Aibileen opens up and brings Minny along. The book has changed my view on the movie. I am excited to see it. I cannot wait to see how the characters come to life on screen. Though I know the movie will not be able to do the book justice (but isn’t this true for every movie made from a book?) To better understand and appreciate this story, you really must read the book.